From Reed Mangels, Ph.D., R.D. "My doctor says I have to drink a quart of cow's milk a day; my parents are convinced I'm doing something harmful; and I'm even starting to wonder if my diet is all right." Even the most committed and knowledgeable vegan may face doubts when pregnant. After all, the so-called experts are all questioning her dietary choices. Actually, it is reasonably simple to follow a vegan diet throughout pregnancy while eating foods that meet your needs and the needs of your baby. I know; I've done it twice. In addition, a series of studies 1,2 at The Farm, a community where vegan diets are a part of a socially responsible lifestyle, have shown that vegans can have healthy pregnancies and healthy children. Here are some things to consider. How much weight you gain during your pregnancy has a marked impact on the baby's size and health at birth. Table 1 will help you to calculate how much weight you should gain. If you were underweight prior to your pregnancy, you should try to gain 28-40 pounds. Average weight women should aim for a 25-35 pound weight gain, and overweight women should strive to gain 15-25 pounds. Adolescents may need to gain 30-45 pounds. A general trend is to have little weight gain for the first 12 weeks. Then, in the second and third trimesters, a weight gain of a pound a week is common 3. Figure 1 shows recommended patterns of weight gain based on your pre-pregnancy body mass index (BMI). Select the graph corresponding to your pre-pregnant BMI. Your weight gain will not necessarily fall on the dashed line but should be approximately parallel to the line 3. Many vegans begin pregnancy on the slim side and may gain weight very slowly. If this sounds like you, you will need to eat more food. Perhaps eating more often or eating foods higher in fat and lower in bulk will help. I found it easiest to drink extra calories and treated myself to a soy milk shake (soy milk blended with fruit and tofu or soy yogurt) in the evening for a few weeks when weight gain was low. Other concentrated sources of calories include nuts and nut butters, dried fruits, soy products, and bean dips. Table 2 shows some ways of getting some extra calories - you need about 340 extra calories per day in the second and 450 calories per day in the third trimester. If, on the other hand, your weight gain seems too high to you and your health care provider, look at the types of food you are eating. Simply replacing sweets and fatty foods with fruits, vegetables, grains and legumes can lead to more moderate weight gain. Daily exercise, as approved by your health care provider, can also help. Step 1. Take your pre-pregnant weight (in pounds) and divide it by your height (in inches) squared; then multiply by 700. BMI = lb/in 2 x 700. For example, if I weigh 110 pounds and am 60 inches tall, my BMI is 110/3600 x 700 = 21.4. Step 2. Use your BMI to find your pre-pregnancy weight-for-height status and the amount of weight you should try to gain in pregnancy. Young adolescents and black women should attempt to gain at the upper end of the given ranges since these groups tend to have higher rates of low birth weight infants. Higher weight gains seem to reduce the risk of having an infant whose weight at birth is very low and who is at risk for complications. Short women (under 62 inches) should attempt to gain at the lower end of the given ranges. Select the graph corresponding to pre-pregnancy BMI. Weight gain will not necessarily fall on the dashed line but should approximately parallel the line. 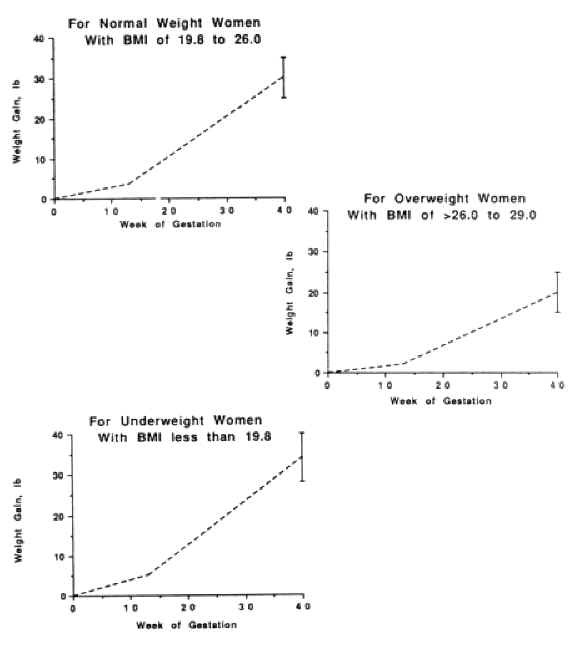 The vertical line at the right of each graph shows the range of recommended weight gain. You will probably get lots of questions about whether or not you are getting enough protein. Current recommendations for protein in pregnancy call for 25 grams more of protein per day in the second and third trimesters for a total of 71 grams of protein 4. One study showed that the average non-pregnant vegan woman was eating 65 grams of protein daily 5, almost enough to meet the needs during pregnancy. If your diet is varied and contains good protein sources such as soy products, beans, and grains, and you are gaining weight, you can relax and not worry about getting enough protein. Many women simply get the extra protein they need by eating more of the foods they usually eat. As an example, you can add 25 grams of protein to your usual diet by adding 1-1/2 cups of lentils or tofu, 2-1/2 cups of soy milk, or 2 large bagels. Vegans also get lots of questions about calcium. Both calcium and vitamin D are needed for the development of the baby's bones and teeth. There is some evidence that pregnant women adapt to low calcium intakes and increased needs by increasing calcium absorption and reducing calcium losses 6. This certainly is worthy of additional study and may be pertinent to vegans whose diets may be low in calcium. However, for the time being, calcium intakes of 1300 milligrams daily are recommended for women 18 and younger and of 1000 milligrams daily for women 19 through 50 7. Pregnant vegans should make a special effort to have 8 or more servings of calcium-rich foods daily. Pregnant women who have regular sunlight exposure do not need any extra vitamin D 7,8. However, if there is any question as to whether or not your sun exposure is adequate, 5 micrograms (200 IU) of dietary and/or supplemental vitamin D is recommended 7. Supplements of vitamin D should only be used with the approval of your health care provider since high doses of vitamin D can be toxic. Fortified foods like some brands of soy milk and orange juice and some cereals are another way to meet vitamin D needs. Iron deficiency anemia is not uncommon during pregnancy, whether vegan or non-vegetarian. Iron needs are much higher than usual in pregnancy because of the increase in the amount of the mother's blood and because of blood formed for the baby. Iron supplements of 30 milligrams daily during the second and third trimester are commonly recommended along with iron-rich foods 3. Additional iron may be needed in case of iron deficiency. Iron supplements should not be taken with calcium supplements and should be taken between meals in order to maximize absorption. Even when iron supplements are used, pregnant vegans should choose high iron foods like whole grains, dried beans, tofu, and green leafy vegetables daily. The regular use of vitamin B12 supplements or fortified foods is recommended for all pregnant vegans. Vitamin B12 plays an important role in the developing fetus. Fortified foods include some breakfast cereals, some soy milks, and Red Star Vegetarian Support Formula nutritional yeast. Folate has been in the news because of its connection with a type of birth defect called neural tube defect. Studies have shown that women who have infants with neural tube defects have lower intakes of folate and lower blood folate levels than other women. Folate is needed early in pregnancy (before many women know they are pregnant) for normal neural tube development. Many vegan foods including enriched bread, pasta, and cold cereal; dried beans; green leafy vegetables; and orange juice are good sources of folate. Vegan diets tend to be high in folate, however, to be on the safe side, women capable of becoming pregnant should take a supplement or use fortified foods that provide 400 micrograms of folate daily. DHA is a type of fat that is mainly found in fatty fish. It seems to be important in the development of the brain and the retina, a part of the eye. Some DHA can be made from another fat called linolenic acid that is found in flaxseed, flaxseed oil, canola oil, walnuts, and soybeans. Choosing these foods regularly and avoiding foods containing trans-fats that can interfere with DHA production, can help to enhance DHA production. Some women may opt to use a vegan DHA supplement produced from microalgae. Pregnant vegans should use iodized salt at the table or in cooking to insure adequate iodine intake. Slightly more than half a teaspoon of iodized salt meets iodine needs in pregnancy while the iodine needs of breast-feeding women can be met by ¾ teaspoon of iodized salt. Other options are a low-dose iodine supplement (check - iodine may already be in your prenatal supplement at 100% of the Daily Value, and, if it is, additional iodine is not needed) or limited use of sea vegetables. All of this advice to eat a plant-based whole foods diet sounds wonderful to many pregnant women. What are the barriers to eating a healthful vegan diet? 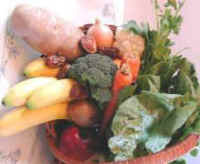 Nausea and vomiting, also called morning sickness, is a concern of many pregnant women, vegans included. Many women are repulsed by foods that used to make up the bulk of their diet such as salads, dried beans, and soy milk. These aversions are extremely common in early pregnancy and are believed to be due to a heightened sense of smell, possibly due to hormonal changes 9. Coping with nausea and vomiting: If it tastes good, eat it! I can remember wanting nothing but saltines and ginger ale for days at a time. Then, one day when my husband was warming up some left-over pasta, it smelled wonderful. I ate 3 bowls full and never regretted it. Try eating low fat, high carbohydrate foods. These are digested more quickly and stay in the stomach for less time giving less time for queasiness. Eat often. Sometimes nausea is really due to hunger. Avoid foods that have strong smells. Sometimes cold foods are better tolerated because they don't smell as much. Have someone else do the cooking if possible and go away from the house while cooking is being done. Be sure to drink juice, water, soy milk, or miso broth if you can't eat solid food. Keep trying to eat whatever you can. Contact your health care provider if you are unable to eat or drink adequate amounts of fluids for 24 hours. Whether you're working full time outside the home or at home full time (or some variation), the thought of preparing elaborate meals and snacks will probably seem daunting. Meals do not have to be elaborate. A meal can be as simple as a bowl of cereal and fruit with soy milk, peanut butter and crackers, or a baked potato and a salad. Use convenience foods like canned beans, frozen vegetables, mixes, pre-chopped vegetables, and frozen entrées to reduce preparation time. Use time-saving appliances like crockpots, pressure cookers, and microwave ovens. Plan to have leftovers. Check out some quick and easy vegan cookbooks for ideas. While many family practice physicians, obstetricians, and nurse-midwives may be quite knowledgeable about nutrition, many are not familiar with vegetarian and especially vegan diets. Your health care provider may have lots of questions about what you are eating and whether or not you will be able to meet your needs. Look on this as an opportunity to educate someone about vegan nutrition. Try sharing this chapter and other materials from the resource list with your health care provider. Keeping a record of what you eat for several days may help convince your health care provider that what you're doing is fine or may highlight areas needing improvement. If you have specific concerns and questions, you may choose to consult a registered dietitian (RD) with expertise in vegetarian nutrition. Remember, a varied vegan diet can meet your needs and the needs of your baby during this exciting time. It is also important to think about alcohol and smoking. Moderate to large amounts of alcohol during pregnancy can cause fetal alcohol syndrome, which impairs mental and physical development. Even one or two drinks of alcohol daily are associated with greater risk of health and development problems for the baby 10. Based on what we know, women should avoid alcohol during pregnancy 10. Cigarette smoking has been clearly linked to low birth weight, which increases the infant's chance of having a variety of health problems. Smoking should also be avoided during pregnancy. Carter JP, Furman T, Hutcheson HR. Preeclampsia and reproductive performance in a community of vegans. Southern Med J 1987;80:692-697. O'Connell JM, Dibley MJ, Sierra J, et al. Growth of vegetarian children: The Farm study. Pediatrics 1989;84:475-481. Institute of Medicine Subcommittee on Nutritional Status and Weight Gain During Pregnancy. Nutrition During Pregnancy. Washington, DC: National Academy Press, 1990. Food and Nutrition Board, Institute of Medicine. Dietary Reference Intakes for Energy, Carbohydrate, Fiber, Fat, Fatty Acids, Cholesterol, Protein, and Amino Acids. Washington, DC: National Academy Press, 2002. Carlson E, et al. A comparative evaluation of vegan, vegetarian, and omnivore diets. J Plant Foods 1985; 6:89-100. Prentice A. Maternal calcium metabolism and bone mineral status. Am J Clin Nutr 2000;71(suppl):1312S-16S. Standing Committee on the Scientific Evaluation of Dietary Reference Intakes, Food and Nutrition Board, Institute of Medicine. Dietary Reference Intakes for Calcium, Phosphorus, Magnesium, Vitamin D, and Fluoride. Washington, DC: National Academy Press, 1997. Specker BL. Do North American women need supplemental vitamin D during pregnancy or lactation? Am J Clin Nutr 1994;59(suppl):484S-91S. Erick M. Hyperolfaction as a factor in hyperemesis gravidarum. Considerations for nutritional management. Perspectives in Applied Nutrition 1994;2:3-9. USDA/DHHS: Dietary Guidelines for Americans, 2005. Washington, DC: Government Printing Office, 2005. The best diet for breast-feeding is very similar to the diet recommended for pregnancy. Protein recommendations are the same, vitamin B12 recommendations are higher, and the recommendations for iron and calories are lower than during pregnancy. If you eat too little while breast-feeding, you may not produce as much milk. Although the recommended calorie intake is 330 calories above your usual intake for the first six months 1, you still may lose weight because of a loss of calories in breast milk. It is safe to lose about 1/2 to 1 pound a week while breast-feeding but more rigorous dieting is not recommended. As in pregnancy, small frequent meals are the best way to be sure that you are getting enough calories. Since you do need extra fluid while breast-feeding, use nutritious beverages like juices, soy milk, soups, and vegan smoothies to provide calories. The recommendation for protein is the same as in pregnancy 1 and can be obtained easily from the extra food you are eating. You should still eat good quality food because you are providing all nutrients to your infant. You will need to be careful to get enough vitamin B12, vitamin D, iodine, and DHA in order to be sure that these nutrients are present in your milk in adequate amounts. Requirements for most other nutrients are similar to those in pregnancy and should be obtained from a varied, healthy vegan diet. Food and Nutrition Board, Institute of Medicine. Dietary Reference Intakes for Energy, Carbohydrate, Fiber, Fat, Fatty Acids, Cholesterol, Protein, and Amino Acids. Washington, DC: National Academy Press, 2002.